Savvy Spending: Kroger: FREE Chips and Queso with your ClickList order! Now through 3/20! Kroger: FREE Chips and Queso with your ClickList order! Now through 3/20! If you're a Kroger shopper, check this out! Now through 3/20, you can get a FREE Chips and Queso with your Kroger ClickList order. This freebie is over a $12 value! The coupon will be applied when you pick up your ClickList order! *Offer expires March 20, 2017. Limit one (1) per household. 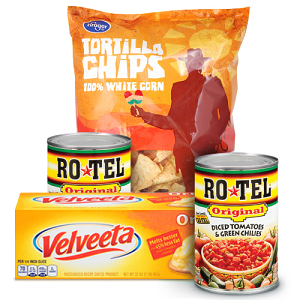 Only valid on two (2) cans RO*TEL® Diced Tomatoes (10 oz. each), one (1) Velveeta Loaf (2 lbs.) and one (1) bag Kroger or Fred Meyer Tortilla Chips (9.75-10 oz. ), an approximate total value of $12.28. Must buy all items in a single ClickList™ transaction. Your preferred ClickList™ store may not have all items listed. ClickList service from Kroger allows you to shop online and pick up your order at the store. The service fee for a ClickList order is waived for your first 3 orders! Fees vary by region for ClickList curbside pickup but is around $4.95.